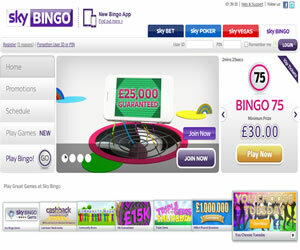 Sky Bingo is owned by the British Sky Broadcasting Group, which is the same company that owns the satellite television provider. The online bingo site is powered by the popular Virtue Fusion software and is part of the Virtue Fusion network. 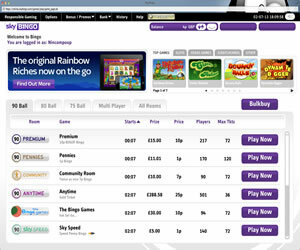 The Sky Bingo homepage is plain but stylish thanks to a purple, silver and white colour scheme which makes a real change from the more usual pink and pastel palettes we see all too often. The page itself is nicely designed with a small scrolling banner advertising their latest welcome offers and promotions. Sitting alongside this, you will find five buttons that link you to the different areas of the site such as promotions and schedule. 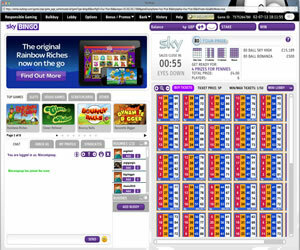 Just below this is a smaller row of nicely animated banners detailing what is going on at Sky Bingo and at the same time allowing you to access important information and a selection of games with just a single mouse click. Registering at Sky Bingo is a little different to what you may have experienced before because they have broken it down into different sections. The first section are your basic details such as your name, address and email address. In the second section you will be asked for a username and a four digit pin number which basically acts as your password. The final stage is where you will be asked to enter your financial details and one really nice touch is the ability to set your own daily limits right from day one. Sky Bingo will welcome you with a bonus on your first deposit and what makes it special is the fact that there are no wagering requirements so you can withdraw any winnings immediately. The first time you enter the Sky Bingo lobby, you will be asked to register a chat name, this is the name you will be known by in the chat room and must be different to your username. The lobby is extremely bright and packed full of fun. Along the top you will find six tabs offering 75 ball, 80 ball and 90 ball bingo as well as their multi-player games such as Marine Mayhem. Each tab will bring up a list of rooms for you to choose from and will provide you with details of the jackpots on offer, the cost of the cards and how many players are in each room. If you have played at any other site powered by the Virtue Fusion software, the rooms will feel very familiar. To the left of the screen you have the chat room and it includes some really nice features such as the ability to increase the text size and colour. You have your own profile so people can find out a bit about you and when you make friends you can add them to your own buddy list and send them private messages. The right had side of the screen is dedicated to your cards and to keep things fun there is a selection of different daubers and colours available including a magic wand, a hammer and even a lipstick. Sky Bingo is also available on your mobile phones and tablet computers. 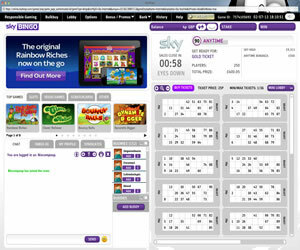 It does not matter if you are using an Android or iOS powered device, simple point your mobile browser to Sky Bingo. You can access all of your favourite bingo rooms and games and even chat to your friends regardless of whether you are on your lunch break at work or sitting on the bus on the way home, as long as you have a 3G or wifi signal; You will be competing against the same people for the same jackpots just as if you were sitting at home on your laptop. Sky Bingo has a decent range of promotions on the go with plenty of free bingo and guaranteed jackpot games to keep you occupied. If you are a fan of the Virtue Fusion software then Sky Bingo is the site for you, the addition of a good loyalty scheme and exclusive bingo rooms combined with the lack of any wagering requirements on bonuses really sets them apart from the rest of the network. Sky Bingo offers a wide selection of bingo games from pattern, multi-line and multi-part 75 ball games, cashline 80 ball to the traditionally English 90 ball games. Additionally you will find themed games like Deal or No Deal Bingo and Lucky Numbers Bingo. There is also an abundance of instant win games available, some with pretty impressive progressive jackpots. The wagering requirements on the current bonus is 3x the amount of the bonus (£75) before you can withdraw from your account.